As a nonprofit, Sharing Wheels relies on volunteers. We simply can’t fix used bikes and offer free community shop space without volunteer support. You don’t need to be a skilled bike mechanic to help out. Ongoing volunteer opportunities are listed below. Saturday Shop Volunteers who can commit at least 4 hours per month are needed to help with customer service during our busy season. We’ll match the job to your skills: simple repairs, taking in donations, answering phones, etc. Must have in depth knowledge of our shop and programs; where parts and tools are located in the shop and be able to adeptly explain our programs and how the shop works. Bike Safety Checks noon to 4 p.m. April 27 in Arlington – 2 people with basic bike mechanic skills needed to help at the Free Family Ride at Haller Park in Arlington. You’ll give kids (and some adult) bikes a quick safety check, fixing minor things like flat tires or squeaky brakes. Bike Everywhere Day 6 to 9 a.m. May 17 at Everett Station. Offer basic safety checks and information about Sharing Wheels during this annual event. Kids bike work parties for our Kids Bike Swap start in April and go through early June. Special work parties are scheduled in the fall for Christmas House and in the spring for our Kids Bike Swap. People with bike shop experience or mechanical training are always needed in the shop. We are happy to provide advice and assistance (where is that tool? ) as you keep your skills fresh refurbishing adult and kids bikes. Beginning mechanics and non-mechanical volunteers willing to get greasy are also needed. 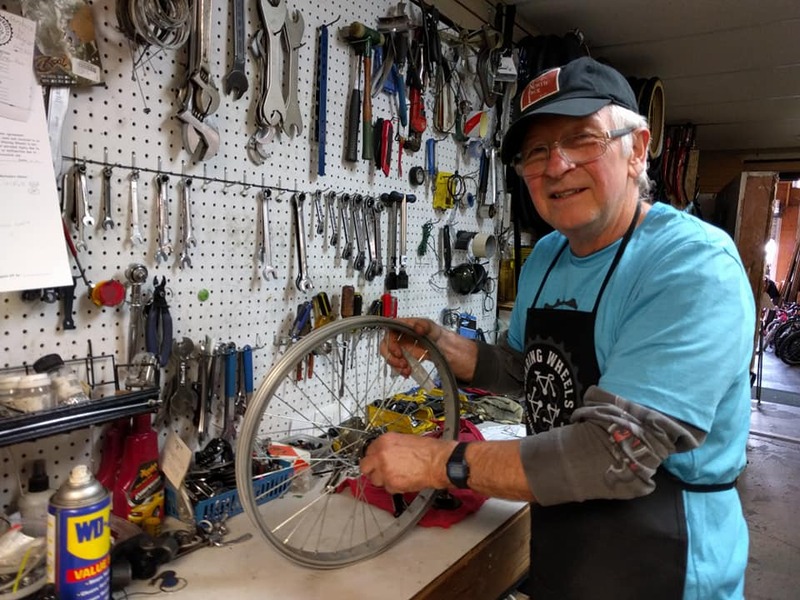 We often host Volunteer Repair Parties where people of all skills can help fix flats, clean bikes, and practice some basics. Do you do social media? We could use your help with Facebook posts and photos. You can also build computer skills by entering data and managing files. Other duties may include creating and delivering marketing materials, acknowledging donors, event planning, and organizing donations. Best if you can commit regular time weekly or monthly for consistency. Community events that support our mission and help promote our work are great places to be – if we have volunteers. Event volunteers help represent Sharing Wheels by staffing a table, sharing shop information, helping with logistics, and returning materials to the shop. If you are interested in helping out at a future community event, contact us.